What motivates people toward an “I don’t see color” orientation? Have you ever heard someone say I don’t see height or hair length? With regards to color, have you ever heard someone deny the color of your shirt or your shoes? 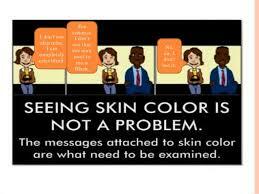 Yet, somehow when it comes to skin color, visual functioning is compromised. In my profession such a loss of contact with reality is considered psychosis. I always find this peculiar. I see my skin tone in its unique shade as clearly as I see that I am wearing a black shoes and a blue shirt. I clearly see the various shades of skin color on the diverse group of people around me. To deny something as fundamental to my being as my physical characteristics is to deny an aspect of my identity. I am a spiritual being in human form with specific biological and genetic traits – skin color, height, body type, etc. That is Who I Am; incarnated in this world, at this time, in this way, for a Divine purpose. That is to be honored, not denied. To do so is to dishonor the will of the Creator. We must be honest about how we have been conditioned to think and feel along color lines. Recently on NPR, a group of black men were interviewed about being perceived as dangerous or a threat simply because of their skin color and the lengths they go to counteract this perception. One guest told the story of being questioned by police officers for being in the neighborhood where he lived. The officers were also black which accentuates the point that we have all been affected. Racial conditioning in the United States goes back to the decision to use African people as slaves. Easily identifiable, the ability to escape captivity and assimilate into society was an impossibility. Regarded as sub-human and brought to the United States as free labor, not free citizens, to do the work of their masters, the status of being lesser than (3/5 human) was written into the original United States Constitution. The media plays a powerful role in shaping perceptions based on color. The portrayal of black men in the film Birth of a Nation is a prime example. Released in 1915, it depicted black men as evil with a lust for white women who would ruin the precious South. A scene where a white woman hurls herself off a cliff to escape the pursuit of a black man clearly conveys the message that death is a welcomed alternative to such relations. The media continues to reinforce negative stereotypes of black men and women in ways that blatantly and subliminally penetrate the psyche. An Iowa newspaper is facing accusations of journalistic racism as they published photos of one group of men accused of a crime in coats and ties and the mug shots of another group of men accused of the same crime. Take one guess at the color of the men whose mug shots were published. Visually, a mug shot links the man and the color of the man to criminality both consciously and unconsciously. Visually, the image of a man in a suit does not equate to criminality. Who thinks of a man in a suit as a criminal? Despite the Bernie Madoff’s, Ken Lay’s, Jordan Belfort’s, Ivan Boesky’s and Michael Milken’s of the world, who thinks of a white man in a suit as a criminal? No shortage of such examples exist. While they often fail to register in the conscious mind, they penetrate the unconscious influencing and shaping our perceptions of those who look like us and those who do not and those who are lighter and those who are darker. The efforts of many led to significant progress in terms of racial equality. We have made great strides through the legislative process but the human heart is not changed through the passing of laws. Sadly, given the manner in which race has been used as a psychological weapon politically it appears we are regressing. Much work remains in terms of racial equality, even more in terms of race relations. In the years following desegregation, overt racism became increasingly socially unacceptable but little has been done to address the deeply entrenched beliefs and feelings associated with the color of skin, reinforced for hundreds of years and exploited for political, social and economic gain to the present day. Such attitudes have not gone away, just masked by denial and repression. The psycho-spiritual damage created by racial conditioning then results in a pathology where people claim not to see what is self-evident. I believe the denial of color is an attempt at acceptance and open-mindedness; albeit a failed and destructive attempt that unconsciously and unknowingly reinforces the racist orientation it seeks to overcome. To see skin color, especially dark skin is to reconnect with how we have been conditioned to think and feel about dark skin color. We must remain mindful that such conditioning along color lines rests uncomfortably in the fabric of the United States. It is in our DNA as a nation. It is individual, familial and ancestral. It is in the air we breathe and while it may not affect all of us to the same degree, it is impossible not to be affected in some way. Seeing color produces psychological dissonance and serves as a gateway into the shadow of race; the socially unacceptable biases we have about those people that lay repressed, hidden, denied and, in some instances, known but disregarded. Not seeing color is neither a compliment nor a statement of one’s commitment to diversity but a means of assuaging guilt and shame. It does nothing to transform the inner darkness of racial bias into enlightened honoring of differences. Actually, all it has done is created a peculiar psychosis. The invitation to all who do not see color is to see it – its beauty and it’s Divinity. The invitation is to own denied biases born of racial conditioning and be with the dissonance. And, if you choose, do the healing work to free energies expended unnecessarily in denial and repression. Through this work, true acceptance and open-mindedness will be achieved and unconscious racist orientations overcome. This entry was posted in Culture, Politics, Psychology, Race, Society, Spirituality and tagged Birth of a Nation, Media, Racial Conditioning, Racism. Bookmark the permalink. 2 Responses to You Don’t See Color? See color. Embrace it. Admire it and appreciate it. I love this.